As the legal marijuana industry continues to find its footing statewide and nationally, development within niche sectors of cannabis product development have appeared with greater frequency and medical relevance than ever before. With a growing variety of marijuana products available for medical patients and recreational customers to choose from, cannabis extraction technician jobs have emerged as integral, competitive careers in the soon to be 22 billion dollar industry. For those whose marijuana experience lies predominantly in the days before medical or recreational legalization, smoking marijuana flower or baking pot brownies might be the extent of their knowledge of cannabis products; little do they realize the many groundbreaking modes of cannabis products revolutionizing the marijuana industry alongside a demand for more effective products. Understandably, there has been some confusion surrounding the nature of concentrates: what they are, if they’re safe and why they exist. Despite speculation that says otherwise, regulated cannabis extraction is a controlled chemical process with a safe product outcome; in fact, many concentrate consumers are medical marijuana patients. Cannabis concentrate extraction is the process of separating THC-rich trichomes from marijuana plant matter, creating a substance that can be converted into concentrates of varying physical qualities and efficacy. The spectrum of cannabis concentrates is dependent on the solvent used to sequester the resin, as well as physical consistency and purity. Concentrate activists swear by this process as it allows for a cleaner, more pure taste, since it forgoes the earthy, plant based taste of the flower, while retaining aroma filled terpenes that carry unique strain flavors. In order to extract, concentrate processors use solvents such as Butane and Carbon Dioxide that separate trichomes from the plant, after which the solvent evaporates without leaving a trace behind. This process is known as Hydrocarbon Extraction. Outcomes of cannabis concentrate extraction results in similar, yet diverse substances including oil, wax, shatter, budder, live resin and more. These products vary in texture and color, with some concentrates appearing opaque and others, translucent. Concentrates can be consumed by vaporizers or dab rigs, both involving the heating of the concentrated substances to produce a potent vapor or smoke. While vaporizers predominantly use oil cartridges as concentrates, dab rigs involve using a small torch to heat the nail of the piece, after which placing a concentrate against the metal or quartz to create a smoke that can be inhaled in the same way as a classic bong. One of the major benefits of consuming concentrates is the high level of THC per serving versus smoking marijuana flower. In fact, many medical and recreational cannabis consumers prefer “dabbing” (as the process is commonly referred to) as it limits the amount of smoking necessary to experience the medical and psychoactive effects. Despite unknowledgeable institutions that posit otherwise, consuming cannabis concentrates is not an inherently riskier process than smoking marijuana flower. In fact, by extracting the resin from plant matter, the purest and most essential parts of the marijuana plant are highlighted without the possibility of consuming mold or bacteria present in cured buds. 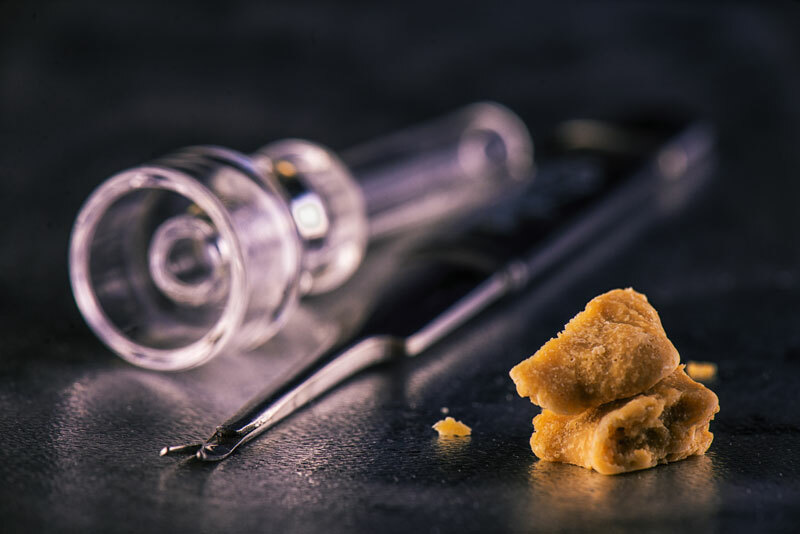 For cannabis patients and consumers, it is advised to purchase concentrates from regulated dispensaries, as the process of creating “homemade” dabs can be a lethal process to the creator and toxic to the consumer. Concentrate processors and extraction technicians are extremely knowledgeable about the process and follow protocol exactly in order to ensure a safe product. Much of the fear surrounding concentrates involves the presence of solvents in products during consumption; however, research indicates hydrocarbon solvents in this process to leave negligible, non-toxic levels behind after extraction. When talking to a budtender at your local dispensary, they may advise that once you’ve had dabs, you’ll never want to use flower again. Due to the pleasant taste, high concentration of THC and easy storage, concentrates are taking the marijuana industry by storm. Not only is extraction used for dabbing, but also for creating edibles and other products. If time is money, dabs are the right option for the jetsetting stoner who doesn’t have time to smoke enough flower to gain all the medical benefits of cannabis. For medical patients, concentrates can be life-changing. The ability to purchase, store and use medical cannabis concentrates with as little fuss as possible helps to streamline the medical process for patients who have used clunkier, more time consuming methods in the past. Where Can I Find Cannabis Extraction Technician Jobs? The process of securing a job as a cannabis concentrates processor or extraction technician requires extensive education and experience in organic chemistry, specifically in using hydrocarbon solvents. In order to safely and efficiently extract substances and process them into products, the technician must be well versed in what quality and safety requirements must be met and how to avoid error. As these are skilled positions, wages can be competitive, sometimes ranging well into six figures for the most successful. Some companies require that extraction techs have years of direct experience in the cannabis extraction business, while others are looking for Ph.D.’s as a necessary qualification. In any case, companies are only looking to hire individuals who are truly qualified and confident in working independently. Competition for cannabis extraction technician jobs is fierce due to financial incentives and interest in contributing to the growth of a booming billion dollar industry. Due to positive job growth outlook in this field, the coming years may bear more opportunities to work a cannabis concentrates processor job as more positions are created to meet demand. When browsing through job postings for cannabis extraction technician jobs, daily tasks vary from company to company, however, all technicians maintain a high level of responsibility. Some technicians work with little or no assistance, preparing all the equipment and materials for extraction themselves before conducting the extraction process. Extraction technicians must also strictly follow protocol and regulations at all times throughout the process from preparation to packaging and production. Since cannabis extraction technician jobs involve working in a lab atmosphere, maintaining the organization and cleanliness of the workspace is paramount, as is recording any necessary data. As the legal marijuana industry continues to offer economic opportunity in the years to come, some are formulating their education plans based on the promise of opportunity in the industry. In the same way that a degree in horticulture can help interested applicants find jobs in marijuana growing, advanced studies in organic chemistry with experience working in labs can help to bring your resume into the pile of most qualified applicants for cannabis extraction technician jobs. It’s smart to look toward the future and prospect how to benefit from an industry that seemingly only has room for growth. Especially with cannabis concentrates extraction and processing, the most innovative and user friendly marijuana products will rise to the top in sales. Already, legions of concentrate supporters have moved over from flower to dabs in astounding numbers. Though cannabis extraction technician jobs can be found in pockets around the country, most positions are located in and around states where cannabis is medically and/or recreationally legal. In order to see if there is a job in your specific municipality, be sure to check your state and local government website to view any current legislation and regulations for this position and others!